$29.95 In stock. Order in the next 9 hours, 10 minutes and it will go out today! In stock. Order in the next 9 hours, 10 minutes and it will go out today! Maybe you need that perfect opener for approaching a group? Or are you looking for that perfect challenge effect for spectator interaction? 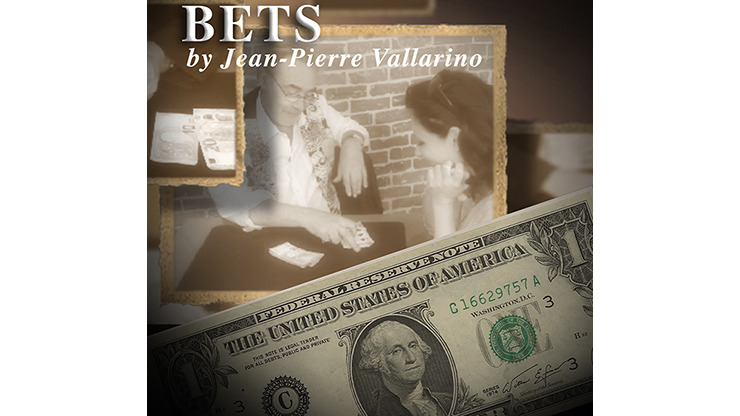 Either way, Jean-Pierre Vallarino has you covered with his new effect, BETS. You give the spectator an offer they can't refuse: You use THEIR deck and YOUR money; winner keeps the money. As they shuffle and cut the cards, you name your selection out loud. You only win if they cut to your card...yet you never lose!!! And can be repeated multiple times! Various presentations are possible. Prediction, challenge, coincidence--you are limited only by your imagination. Get ready to push the boundaries of the possible! Bet on a winner and get BETS now! Available in US, Pound and Euro currencies.